Den Hartog Industries is pleased to introduce a new injection-molded bulkhead fitting assembly to our line. 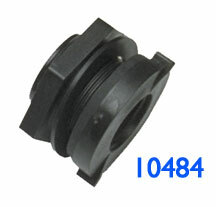 This new 3/4″ Bulkhead features a 1 7/16″ hole requirement. This assembly consists of a fitting body, nut, washer and sealing gasket. Product is designed to accept option DHI 10127 Stainless Steel Ant-Vortex Clip to prevent cavitation when withdrawing fluids from the tank. Note: The previously used item #10501 will no longer be available. 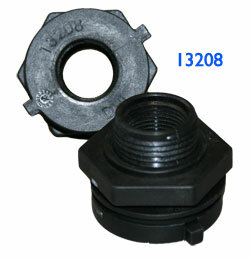 The new item, 13208 will be used whenever a 1 7/16″ hole requirement is preferred. Ace Roto-Mold’s 3/4″ Ace Heavy Duty Bulkhead is also still available with a 1 3/4″ hole requirement. Item 10484 will continue to be the standard ftitting in tanks listing a 3/4″ fitting as standard in the catalog. Visit our Fittings page to view product specifications and additional information.